For the past three years, nearly two-dozen air and space museums, science centers and educational institutions have been competing to display one of NASA’s three soon-to-be-retired space shuttle orbiters. On April 12, NASA Administrator Charles Bolden is expected to announce his choices for the shuttles’ new homes. To date, only Bolden and his team have been privy to the full list of organizations vying for the orbiters. Interested organizations needed to be in the United States or one of its possessions; be able to house the space shuttle in a suitable climate-controlled indoor display or storage space; be ready and able to accommodate delivery of the shuttle by modified Boeing 747 jetliner by as early as December 2011; and be able to afford the estimated $28.8 million needed to prepare the orbiter for safe display and for transport to the museum. To date NASA has not identified or confirmed any of the potential space shuttle suitors with the exception of the Smithsonian Institution, for which it has reserved the orbiter Discovery since first announcing the spacecraft would be awarded to museums. Display plan: Shuttle to be suspended from ceiling of yet-to-be-built state-of-the-art glass pavilion and learning center such that the orbiter is set against the backdrop of Lake Michigan from one side and the Windy City’s skyline from the other. About the museum: America's first planetarium founded in 1930, the Adler is home to three full-size theaters, extensive space science exhibitions, and one of the world's most extensive antique astronomical instrument collections on display. Display plan: Not yet revealed. About the museum: Founded by the American Association of University Women in 1961, the museum incorporated the collection of the Texas A&M Museum in 1970, including two historically important local botanical collections from 1883 and 1897. Each year, the museum reaches about 50,000 children and adults. Other spacecraft on display: None at present. NASA has said it intends to give its space shuttle motion base simulator to the museum. Display plans: Not yet revealed. Notable supporters: None publicly identified. About the museum: Named by Forbes.com as one of the most popular museum destinations in Southern California, the museum has seen more than 18 million visitors since opening in 1998. The center is a public-private partnership between the State of California and the not-for-profit California Science Center Foundation. About the museum: Home to the largest airplane ever constructed and flown just once, the Spruce Goose, the Evergreen currently displays over 200 aircraft and exhibits. Display plans: The shuttle would be exhibited in a yet-to-be-built glass-enclosed hangar located on Pier 86, next to where the aircraft carrier-turned-museum is berthed and where a Concorde supersonic jetliner is currently displayed. About the museum: Opened in 1982, the converted World War II aircraft carrier sees more than 915,000 visitors per year. Before being made into a museum, the Intrepid recovered two NASA spacecraft: Scott Carpenter’s Mercury capsule Aurora 7 and Gemini 3. Other spacecraft on display: None at present. Display plans: The Complex plans to construct a $100 million, 64,000 square-foot exhibit that would display the orbiter "in flight, showing how the spacecraft worked in space and providing a unique vantage point for guests." About the museum: The official visitor center for NASA’s Kennedy Space Center since 1967, the complex is one of central Florida’s most popular tourist destinations with more than 1.5 million visitors each year. Managed by Delaware North Park Services for NASA, the 70-acre facility has been expanded in recent years to incorporate interactive attractions, including the Shuttle Launch Experience. Display plans: The museum has proposed a new "Space Exploration" building that would showcase a shuttle with a transparent walkway circling the orbiter, stopping at platforms for closer public viewing. About the museum: Founded in 1979 as the March Air Force Base Museum, it was originally operated by the U.S. Air Force until being transferred to a non-profit foundation in 1996. The museum houses over 70 different aircraft, including a B-29A Superfortress and an SR-71 Blackbird. Display plans: The orbiter will be displayed in a yet-to-be-built 200,000-square-foot building as part of a new “Space Gallery” covering the history of America's space program. The new hangar will also house the museum's collection of presidential aircraft and the story of Air Force “global reach,” featuring cargo and tanker aircraft. The Boeing Company has pledged $5 million to the construction of the facility. About the museum: Located at Wright-Patterson Air Force Base, the museum is the world's largest and oldest military aviation museum featuring more than 360 aerospace vehicles and missiles on display amid more than 17 acres of indoor exhibit space. The U.S. Air Force operates the museum complex. Other spacecraft on display: Not applicable. Display plans: Not yet revealed (officials have said that a shuttle won’t fit at the Balboa Park museum so another location would need to be identified). About the museum: California's official air and space museum and education center, the San Diego Air and Space Museum (formerly San Diego Aerospace Museum) was established in 1961. In 1986, the museum became the first aero-themed museum to be accredited by the American Association of Museums. 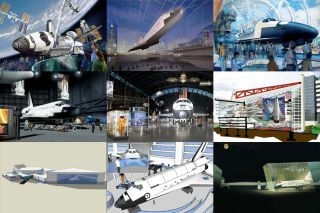 Display plans: If awarded Discovery as anticipated, the museum plans to display it within the McDonnell Space Hangar where the prototype Enterprise is currently exhibited. About the museum: The Udvar-Hazy Center near Dulles International Airport is the companion facility to the National Air and Space Museum in Washington, DC. The building opened in December 2003, and provides enough space for the Smithsonian to display the thousands of aviation and space artifacts that cannot be exhibited on the National Mall. The two sites together showcase the largest collection of aviation and space artifacts in the world. About the museum: Official visitor center for Johnson Space Center, which is home to NASA’s space shuttle program, the astronaut corps and Mission Control. Since opening in 1992, Space Center Houston has hosted more than 11 million visitors. Self-described as an “edu-tainment” complex, the center blends kid-friendly permanent and traveling exhibits with museum displays and theater presentations. Display plans: The orbiter would be displayed in a new 15,500-square-foot, $12 million "Human Space Flight Gallery." The museum broke ground on the new building in June 2010 and expects it complete by fall 2011. About the museum: One of the largest independent air and space museums in the world, the museum's collection includes more than 150 historically significant air- and spacecraft, as well as the William E. Boeing Red Barn -- the original manufacturing facility of the Boeing Co. The Airpark includes outdoor displays with the first jet Air Force One, a Concorde airliner, and the first Boeing 747 jumbo jet. Display plans: A new addition to the museum would display a space shuttle orbiter vertically, such that its nose would be closest to the ceiling and tail near the floor. About the museum: Celebrating Tulsa's aviation heritage as well as its future in the aerospace industry and space exploration, the museum has 19,000 feet of exhibit space, a library, hands-on educational displays, and a planetarium. It was in Tulsa that the space shuttles’ payload bay doors were assembled. Display plans: The museum acquired the Orbiter Protective Enclosure, which NASA had built to protect and shield a space shuttle orbiter from prying eyes were it ever forced to land outside the U.S. while carrying classified cargo. The center has proposed the OPE as an appropriate home for a retired orbiter. About the museum: The official visitor center for NASA’s Marshall Space Flight Center, the U.S. Space & Rocket Center is also home to U.S. Space Camp. NASA's first visitor center, opened in 1970, it has served over 12 million visitors to date. Among the eight organizations that withdrew from consideration between NASA’s 2008 and 2010 requests for information, were the Kansas Cosmosphere and Space Center in Hutchinson, Kansas and the Dryden Flight Research Center at Edwards Air Force Base in California. NASA is expected to announce the final destinations of Discovery, Atlantis, Endeavour and the Enterprise test orbiter on April 12, which will also mark the 30th anniversary of the very first space shuttle launch – STS-1 – in 1981. It will also mark the 50th anniversary of the first human spaceflight by cosmonaut Yuri Gagarin in 1961. Robert Pearlman is editor of collectSPACE.com. You can follow him on Twitter at @robertpearlman and collectSPACE at @collectSPACE.